Jet Set Radio HD Review – Nice, Nice! 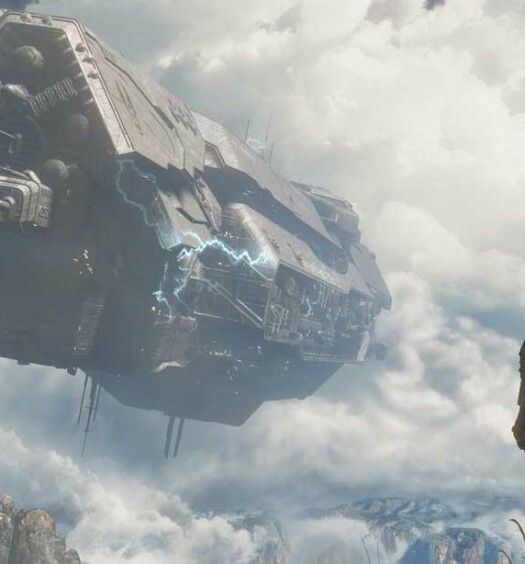 With the explosion of HD titles and remastered collections hitting the market in recent years, nostalgia has become somewhat of a commodity in the industry today. And rightly so, as HD remakes provide a satisfying one-two punch; giving oldies the games they loved in their youth, while also offering younger audiences the chance to experience such fine offerings. 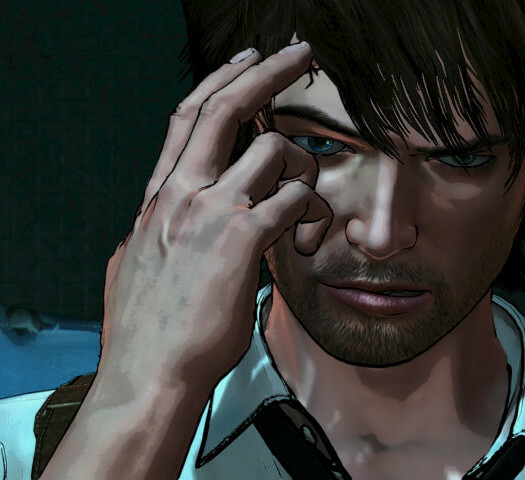 Numerous series have undergone the popular HD spruce-up treatment such as Devil May Cry, Silent Hill, God of War and Ratchet & Clank. Even old greats such as Gunstar Heroes and Streets of Rage II have undergone a semi-high-def transformation. However, not every modernisation of previous greats has been the success that fans would have hoped for. Konami dropped the ball somewhat with their shoddy Silent Hill HD Collection, yet absolutely nailed it with the Metal Gear Solid HD Collection. The point being is that when a publisher announces that an old classic is to be given a lick of shiny new HD paint, it’s difficult to know what to expect. Either you’d be excited at the chance to relive a classic experience in a prettier package, or nervous that the guys in charge will muck it up. With Jet Set Radio HD, and Sega’s abysmal Crazy Taxi HD remake, you’d have been forgiven for being slightly pessimistic. If that’s vandalism, I’d like to see art. As one of the Dreamcast’s more memorable titles it was inevitable that Sega would eventually doll up such a cult classic for a second chance to shine. And to be honest, this is the most action the series has seen in ten years. Nevertheless, I’m happy to report that my personal favourite, Jet Set Radio, has been ported to HD consoles successfully and not without a tad of bravado to boot. Inspired by underground Japanese musical and artistic movements of the late 90s, Jet Set Radio tells the story of the GGs: a gang of rollerskaters who reside in a caricatured, fictionalised version of Tokyo (fittingly named Tokyo-to). The GGs are competing with rival skating gangs and vying for control of the streets by way of tagging the place with graffiti. Narrated by pirate radio DJ Professor K, the story is immensely entertaining despite its cheesiness, and it’s always fun to hear what Professor K has to say. Eventually this escalates to the cops getting involved with bad cop Captain Onishima at the helm – who is more than happy to send in attack dogs, paratroopers, SWAT teams, tanks and helicopters just to rid his streets of a few skater punks. Narrated by pirate radio DJ Professor K, the story is immensely entertaining despite its cheesiness, and it’s always fun to hear what Professor K has to say. However, out of everything Jet Set Radio brings to the table, the story is not what it has been remembered for; it’s everything else. 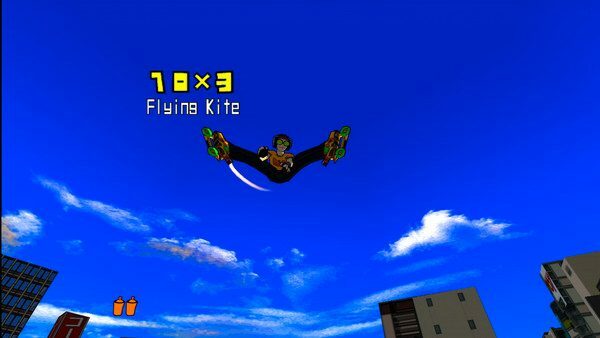 Jet Set Radio’s gameplay is somewhat straightforward. When going into a mission, you choose from a selection of widely varied characters. You unlock more as you progress through the game and each are charming in their own unique way, all behaving slightly differently; but more on them later. In each level, you’re tasked with spraying areas of the map marked with a red arrow within a certain amount of time. The more tags you lay, the greater the threat your antagonists pose, with Onishima and co. doing their absolute worst to take you down. When the cops come calling, you best not be stalling. On your way to spraying locations, you’ll have plenty of opportunities to show off by pulling tricks and grinding along rails. Not only will this boost your score, but you’ll travel faster as a result, allowing you to perform a wider variety of tricks. You’ll also need to do this to reach hidden areas or collect Graffiti Souls, which will unlock a new piece of graffiti for you to use in-game. Tony Hawk’s Pro Skater this ain’t; you’ll grind along rails simply by landing on them, and grind stances and aerial tricks are predetermined. 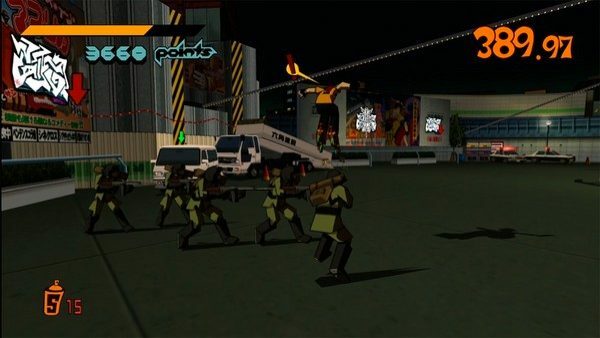 This isn’t a huge problem given the pace of the game and overall goal, but those looking for an in-depth extreme sports simulation will be disappointed as Jet Set Radio is simple, arcade fun. At the same time, though, it’s important to grind and pull off tricks as you progress as this will add to your score. When you finish a level, the amount of health, time and graffiti you have leftover will also be added to your score, and are all things you should take into account if you want to achieve each stage’s elusive ‘Jet ranking’ to unlock the super-secret characters. As previously stated, your main goal in most levels is to spray every marked tag on the map. There are three types of tag: small, large, and extra large which require one, three and seven cans of spray paint respectively. Spray paint can be collected in pick-up form and they too come in three types: a yellow can for one, a blue can for five, and a red can that will restore some health. How a can of paint can possess healing qualities is beyond all manner of logic, but hey, so is sending in attack choppers to slaughter a few meddling kids. Normalcy isn’t this game’s forte. So, that’s basically Jet Set Radio in a rather voluptuous nutshell, but what has its HD transition brought to the fray? Quite a lot actually. Cel-shading is still a popular technique in the industry today, and Jet Set Radio was the first game to use it. It looked stunning back then and I’m proud to say it still looks stunning now. Aside from the obligatory HD upscale, character outlines have been smoothed out and they look better than ever. Environments are richly populated and full of colour and life. Even the graffiti creation tool has benefited, as the larger resolution allows for more thorough attention to detail. This is a game that has aged incredibly well, probably more so than any other game of its time and I do not say that lightly. Throw in full camera control with the right analog stick and you have a remake that serves its purpose: improving upon the base game. There’s even a bonus documentary detailing the making of the game. Beat’s clearly high as a kite. If you haven’t played Jet Set Radio yet, you may have at least heard of its legendary soundtrack. Believe me when I say this is a soundtrack that’s so good it will have you listening to it even when you’re not playing the game. Mixing many styles and courtesy of several non-mainstream acts, Jet Set Radio’s soundtrack is as vibrant as its visuals and it’s fair to say the experience would be lesser without it. There are two songs missing from the original release, but the HD remake does include exclusive tracks from both the European and North American releases, so it’s actually the most complete Jet Set Radio’s soundtrack has ever been. Some songs from Jet Set Radio Future can also be unlocked, though they’re sadly restricted to the bonus menu and cannot be heard in-game, which is somewhat of a silly oversight. Speaking of silly oversights, the original game allowed players to share custom graffiti using the Dreamcast’s online service. With the likes of Xbox Live, PSN and Steam, this is a feature that really could have made the HD release that much better. There’s online leaderboards, so I’m fairly sure recoding the sharing system wouldn’t have been too much trouble. Nevertheless, it does little to take away from the already fantastic experience. You’ll finish the main game in around 5-6 hours. Sure, it’s not that long, but there’s plenty to keep you coming back. Aside from the sheer quality of the main game (that’s solely enough to convince you to keep playing), you’ll be kept busy by gunning for high scores to unlock secret characters and the omnipresent leaderboard podiums. There’s also over a hundred Graffiti Souls to be hunted down, now with a trophy/achievement attached as added incentive. Jet Set Radio has undergone one of the best HD conversions yet. 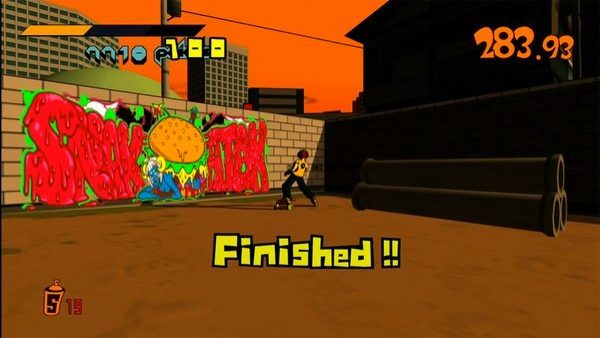 Adding extra oomph to the already excellent visuals, and keeping intact the gameplay and soundtrack that made it a classic all those years ago, Jet Set Radio HD should be in everyone’s digital collection, whether you’ve played the original or not. Go pick this one up as soon as you can!